Disaster - Aka Lipslide. A 180 ollie landing on the center of the board with the front trucks in the ramp and the back trucks on the deck. This trick is a disaster because they can break boards if done too hard. Drop in, pumping, rock to fakie, switch rock to fakie, rock and roll, ollie, 180 ollie, lipslide. Disasters or lipslides are fun. You do an air and land into position. Feeling the board smack down in the right spot is a really good feeling. Frontside D’s or Frontside Lips involve a 180 ollie, landing on the center of the board and rolling in from a switch rock position. Be sure to have switch rocks under your belt. This trick feels best when you land on the middle closer to the front truck on the deck. Aim high but don’t worry if you land near the back truck. It will get easier. You need some good speed because you will ollie and twist most of your body and the board up and over the coping. You can pop the tail or bonk the back wheels off the coping to get into the air. · Roll at the coping with good speed. · Put your feet in frontside 180 ollie position. · Wind up for a frontside 180 ollie. · Get ready to pop the board at least a board length from the coping. · Pop the 180 ollie and start rising up over the coping. 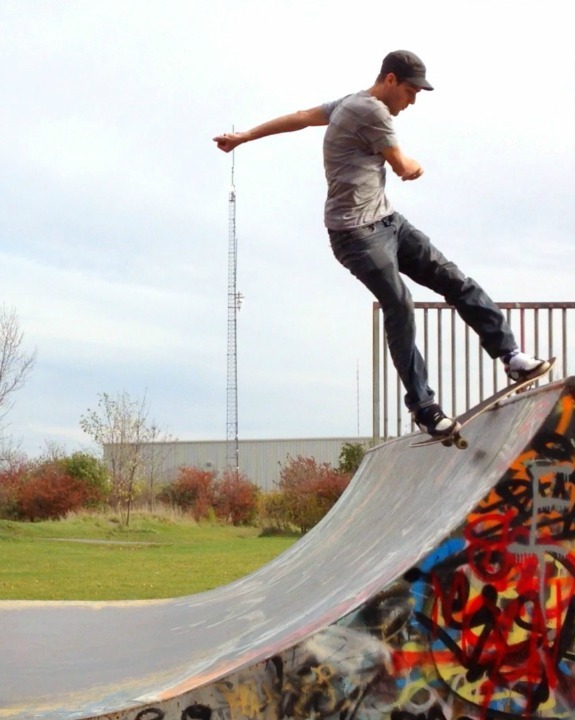 · Point your back foot up and over the coping. · Let your front foot stay up in the air while you rotate. · Land in the middle of the board and extend the back leg to place the board down. · Crouch to absorb the landing. You don’t want to snap the deck. · Once you are landed gain your balance and stand up a bit. · Now put your body back into the ramp and lift the back wheels up to switch rock back in. Try and land with your foot lined up over the coping on top of the board. This will make it less likely that you break anything. Try doing a switch kickturn into this trick. Roll towards the coping and turn from the front wheels up into a switch rock. Then rock back in. This is a trick unto itself and a great way to start mixing up your stance and tricks on ramp.